From the 14th to the 18th of January 2013, inspiring and experienced artists will come together at Corban Estate Arts Centre’s Summer School in West Auckland. This stimulating annual event attracts participants from all over New Zealand. The array of eleven diverse courses are taught by some of the country’s best practitioners in their field as well as some notable international arts practitioners, including printmaker Alexis Neal, bronze sculptor David Reid, contemporary stencil artist Hayley King (aka Flox) and award winning novelist Linda Olsson. Painter Evan Woodruffe will share his techniques using oils while Dagmar Dyck will explore new horizons in mixed media painting. Craft artist Anna Browne will lead a course in fabric arts, while processes and techniques in glass casting will be taught by Fiona Rennie Schweiters and an exploration of sculpture and installation using various media will be led by sculptor Stephen Woodward. For the first time, the Summer School offers courses in contemporary dance with dancers from Atamira Dance Company and sacred song with composer and ethnographer, Jyoshna La Trobe. The length of courses varies from two and a half days to a full five days. In addition to spending time in the course of their choice, participants may choose to attend an evening where each tutor/artist gives a brief presentation of some aspect of their arts practice. These widely varied presentations are always a much anticipated element of the Summer School stimulating ideas for those attending. Some of these tutor/artists will be part of an exhibition being held in Corban Estate’s Homestead Galleries. Another optional element of the Summer School is a guided visit to the public art installations of Auckland’s Wynyard Quarter. To find out more about the Summer School 2013 and Corban Estate Arts Centre’s ongoing activities, programmes and events visit: www.ceac.org.nz . To be sent the full Summer School programme contact us at: info@ceac.org.nz or by phone at (09)838 4455. Corban Estate Arts Centre is open seven days a week, from 10am to 4.30pm except for public holidays and over the Christmas/New Year period. A common thread that is independent of their shared creator links these enigmatic paintings. It may not be evident on first glance but each of these artworks has been abandoned or rejected for not reaching Brent Wong’s level of perfection. Whether the deficiency lay in their composition, perspective, colour relationships, content or an attack of the elements, none have been exhibited publicly. It thus begs the question: why is now the time to share them with the world? In 2008, after painting for over forty years, Brent Wong decided to stop: ‘You get out of that situation of being a painter. As a painter you can’t see yourself.’ Wong began to feel that painting was not the ideal medium to fulfil his creative aspirations. Rather, the dynamism of music and its immediate effect on the listener was more analogous with his focus of overwhelming one’s consciousness. This hiatus from painting gave Wong distance and clarity from what was an emotionally invested practice for the artist and the capacity to proceed confidently with an exhibition of paintings that revealed his method. There is a clear reason why the sketches and cartoons of legendary painters like the Old Masters are still popular: it gives the viewer an insight into the artist’s creative process and reveals how a blank piece of board can be transformed into another world. It brings these revered beings back down to earth by exposing their shared need to plan, contemplate, experiment and reconsider, as well as make mistakes and start again. 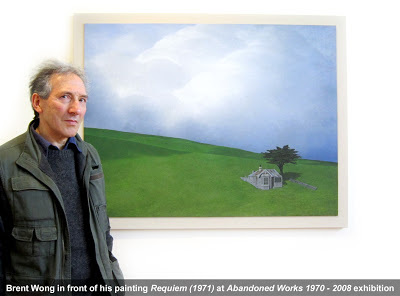 Abandoned Works 1970 – 2008 divulges the process of one of New Zealand’s most eminent painters by exposing the under-painting and preparations of some of Wong’s most recognisable compositions and exposes the considered designs of this renowned perfectionist. A self-taught painter, Wong’s artistic career began in the field of drawing. After brief experimentations with watercolour and oil, he settled on acrylic as his medium of choice. Its quick drying qualities gave him the flexibility to easily apply successive coats of paint and make drastic changes where necessary. He has been known to spend more than three years on a painting before he consented to its public display, adding countless layers of acrylic paint to achieve a jewel-like lustre to his surfaces. This continuous quest of perfection is an enduring part of Wong’s creative pursuits, potentially facilitated by his early tertiary education as a Fine Arts student at the Wellington Polytechnic in 1963. The degree programme’s new emphasis on graphic and industrial design refined Wong’s technical approach, but did not satisfy Wong’s creative imagination. Rather it was the expansive view outside his Vivian Street family home in central Wellington that captured his attention and prompted the frequent architectural presences and geometric patterns in earlier paintings such as Window (1967). The stretch of rooftops and myriad of residential and office buildings seen from his window are dominant shapes and motifs throughout his oeuvre, but these do not reflect a fixation for nostalgia. The Victorian Gothic eave brackets on the half-demolished shell of the building in Ruin (1972) bear a resemblance to similar Wellington buildings in Wong’s environs. One could assume its sorry state may be a means of memoriam of a now-demolished house from his street, but is instead an instance of Wong using his memory to inhabit this landscape. His early works were initially composed as line drawings of interiors and three-dimensional formations with exaggerated perspectives, such as Structure (1967). Like a stage set, Wong then experimented with proportions and colour. In retrospect Wong has identified the connection between these compositional puzzles and the interconnecting puzzle-like structures of some of his floating constructions. Many of these constructions stemmed from doodles created during his nightshifts as a copy holder for the Dominion newspaper and became more formalised and coherent when placed within a composition. This sketching was a means of relaxation during the artist’s serious bouts of depression and anxiety. Floating House and Cloud (1972) features two buildings situated on a parched, empty landscape. This is not simply an exercise in architectural drafting or a memento of a significant event or person, but rather a disturbing illustration of displacement and alienation. The subconscious presence of these local buildings inadvertently observed on a daily basis manifested during Wong’s anti-depressant-fuelled automatic writing experiments and were transformed into a symbol for the artist himself. The way in which one of the buildings floats in the centre of the picture plane anchored by an invisible thread to the fixed building on the slope could be interpreted as Wong almost disconnecting from concrete reality and descending into the dull, neurotic state of mind induced by his medication. It is this technique, and the juxtaposition of bizarre objects like paua shells and eggs (present in Environs (1969)) which brought about Brent Wong’s Surrealist label during this period. Devout members of this movement, such as André Breton and Salvador Dalì espoused the virtues of automatism in the pursuit of accessing the ‘third eye’ and communicating the subconscious in a tangible form. However, what differentiates Wong from these artists is his inability to completely let go and give over the particulars of an image to his subconscious. He is always conscious of what he is doing in some way and bearing each painting’s ultimate manifestation in mind. Initially Wong’s landscapes were purely a base upon which content could be added. Unlike American painter Andrew Wyeth or New Zealander Grahame Sydney, Wong’s landscapes were not painted from life or photographs and instead were created in his studio from memory. The repetitive geometrical patterns of these outlooks allowed Wong to plan his scenes to the nth degree, laying the groundwork to imbue these carefully considered compositions with content and align them with classical painting. Consequently these landscapes may be recognisable as ‘New Zealand’ landscapes but are not to be interpreted within the realms of New Zealand Regionalism, which was characterised by a focus on place and local identity. Instead, the landscape is not the centre of attention in Wong’s paintings but rather just the stage upon which action was to be enacted. 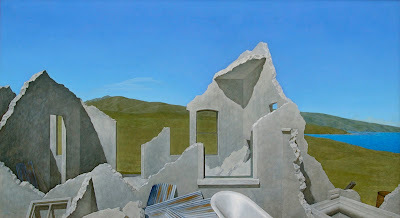 It is contrary, then, that while Wong’s earlier paintings may be concerned with self and its relationship to the universe, there is a noticeable lack of people in these derelict spaces. Except for his 1968 painting Theatre, Wong simply removed the presence of humans from his compositions, leaving only the remains of habitation which is relatable but ultimately disconnected from our reality by their lack of integration with the surrounding landscape. Their isolation from each other imbues the picture plane with a profound sense of dislocation. This is supplemented by the portrayal of some houses as detached from their foundations and bizarrely suspended in the air, like the aforementioned Floating House and Cloud. They are not the only objects Wong hangs in his skies – several works feature more peculiar characters such as jellyfish. Snowstorm (1973) even features an oversized snail crawling across the ridge. 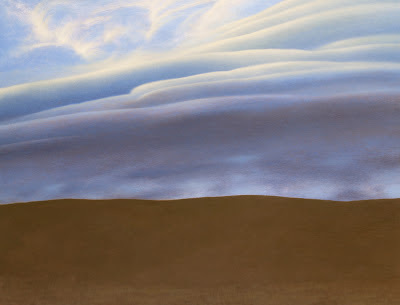 Paintings like The Wandering Land (1974) have an especially extraterrestrial guise in the way the pyramidal-shaped slice of earth tilts towards the terra firma in an almost threatening way. It is the looming, unexplainable element of these suspended objects which generates an eerie atmosphere. Their incongruous presence and the lack of information about what will happen next can potentially fill the viewer with dread and uneasiness. Wong’s disturbed inner state during their execution unconsciously permeates his compositions; the picture surface acting like a mirror reflecting the creator’s anxiety. Thus these landscapes are more metaphysical than tangible: a visual autobiography that contains dreams as well as fears. Moreover, the unfinished nature of these works is apt for their autobiographical edge – they are an incomplete story which, like life, will only conclude with death.